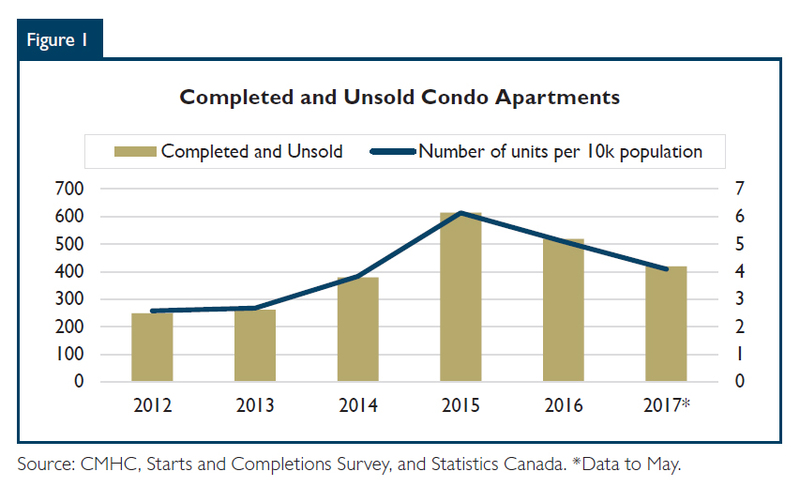 Ottawa witnessed a condominium apartment construction boom in 2012 and 2013 with 2,317 and 2,336 units started in each of those years, which is over two times the average number of starts over the previous 10 years. This construction boom resulted in a surge in the number of completions over the 2014-16 period. Weaker first-time buyer employment and a decline in net migration numbers led to soft demand conditions for newlybuilt condominium apartments. This meant that a high number of units remained unsold, both in absolute terms, as well as relative to the population (see Figure 1). On the existing home front, condominium apartment resale market activity declined over the 2012-14 period. Although sales grew in 2015 and 2016, they remained below their 2011 peak. Condominium apartment active listings have trended up since 2010, while sales have trended down, pushing down the sales-to-active listings ratio (SALR) into or near a buyers’ market during the 2013-15 period. Rising supply and weak demand also led to real1 price declines for four consecutive years from 2013 onward (see Figure 2). Not only did listings rise and sales weaken, but it also took longer to sell a condominium apartment. 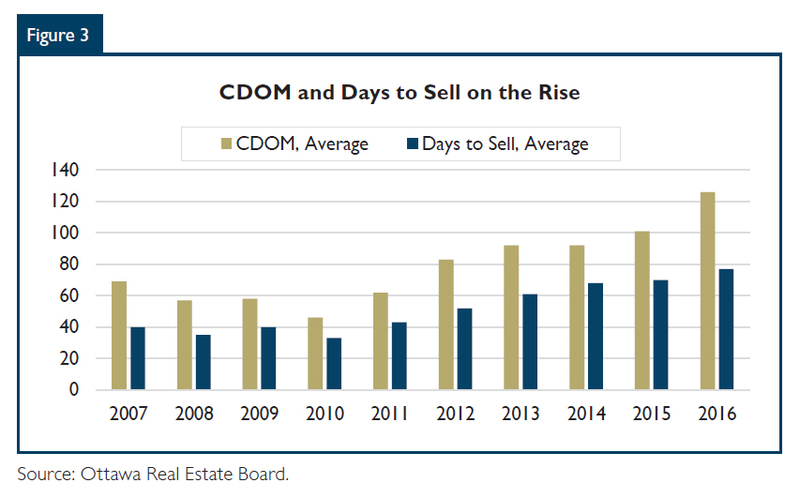 The average number of days to sell and the average number of cumulative days on the market (CDOM) have been rising almost steadily since 2010 from 33 and 46 days to 77 and 126 days in 2016, respectively (see Figure 3). Lastly, active apartment listings have been allowed to expire at a greater frequency over the past five years. In particular, between 2012 and 2014 expirations rose by 21% to just over 4,200 and remained at that level in 2015 and 2016. The oversupply of condominium apartments seems to have spilled into the rental market as evidenced by the rise in the condominium apartment rental universe, which rose from 5,426 units in 2012 to about 9,600 units in 2016. 2016 in particular saw a large rise from 2015 (31% or 2,304 units) in the number of condominium apartments offered for rent, coinciding with the rise in the number of completed and unsold units. Condominium owners unable to sell their units in the resale market may have opted to rent them out instead, encouraged by the relative stability of Ottawa’s rental vacancy rates2 and steady rental demand. In support of this argument, the number of condominium apartments offered for rent rose substantially in areas where newly built condominium apartment sales have slowed. Condo Apartments: complements or substitutes to purposebuilt units? 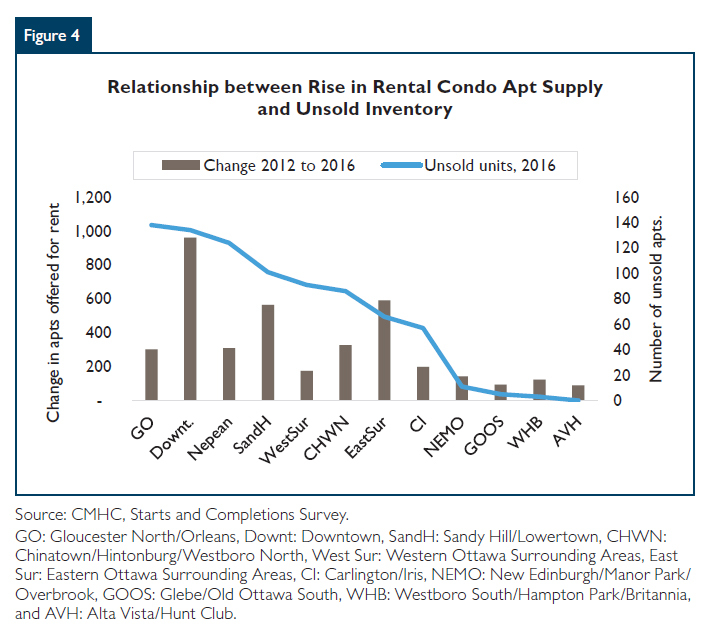 The purpose-built rental apartment stock in Ottawa is ageing: 76% of the units in the CMHC 2016 Rental Market Survey universe were built prior to 1980. Only 5% of the purpose-built rental apartments in the universe are in structures built in 2000 or after. 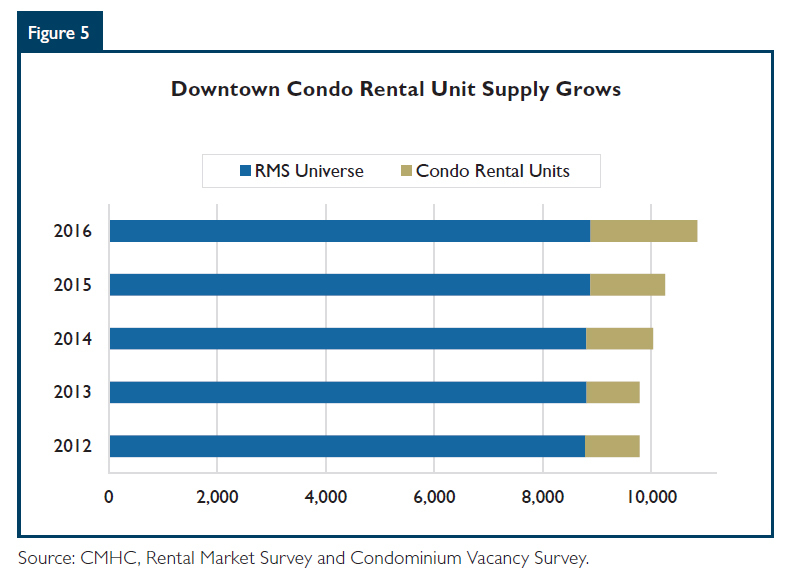 The purpose-built rental universe has not increased much in the downtown4 area, which has meant that the bulk of the increase in rental offerings has come from condominium units (see Figure 5). In particular, rental condominium offerings in the downtown area increased from 9.4% to 10.1% to 13.9% of total universe (RMS5 + Condo Universe) from 2014 to 2016, respectively, an indication that condominiums offered for rent are filling in the gap left by what has been a stagnant purpose built rental universe over the past decade. Since 2012, purpose-built apartment starts began to slowly rise once more, and have been almost on par with condominium apartment starts since 2015. Some new purpose built structures are also trying to match new condominium product on the market targeting certain demographics (seniors) who may have sold their homes and wish to move into rentals, or persons with higher average incomes. The vacancy rates of purpose-built and condominium apartment rental offerings have moved in the same direction over the 2007-16 period. Indeed, changes in these vacancy rates were strongly and significantly positively correlated at 71% over the period.6 The strong positive correlation implies that the two types of rental accommodations are compliments over time, and that market demand for rentals influences vacancy rates in both market segments in the same way. Movements in median rents are also positively correlated, except for rents on three-bedroom units. The degree and significance of these relationships also vary by bedroom count.7 In particular, there is a strong and positive correlation between changes in one-bedroom median rents on either side of the market, suggesting that such units are complements.8 Although the number of completed and unsold units has been declining and is now just below the problematic threshold9 , the number still remains elevated. The market remains cautious toward new condominium construction. It is unclear if Ottawa will once more see a reversal of interest toward condominium apartment starts in light of the new rent control policies, or will continue to see an even split of condominiums and purpose-built rentals as seen in recent years. One thing is likely, high density construction in core areas is here to stay, but which tenure type dominates will be determined by demand and supply dynamics. The vacancy rate in the purpose-built universe averaged 2.9% over the 2012-2016 period, while it averaged 2.4% for condominium apartments; both fairly tight rates. Fixed sample condominium apartment average rents grew on average 1% over the 2013-2016 period, and declined from 2013 relative to 2016 by 2%, while fixed sample purpose-built apartment average rents grew an average 2% each year over the same period, with no decline, and have posted positive growth continuously since 1990. Downtown area includes Sandy Hill and the Glebe. The series for purpose-built and condominium vacancy rates were non-stationary, so the correlation tests were performed on the differenced series. The differenced series are stationary at the 5% level of significance according to ADF tests. The correlation is significantly different from zero at 5% level. Movements in one-bedroom median rents are highly and significantly correlated at 90% Two-bedroom median rents are less highly correlated at 38%, and the relationship is not significant at the 10% level. This report compares only one-, two- and three-bedroom units as data on the rental rates of bachelor condominium units is not available. Also note that the data on average rents for one-bedroom condominium apartments is not available for 2015. Since condominium units offered for rent are generally scattered across numerous structures with numerous owners, there are differences in the rents being asked in any given year for similar condominium units, even within the same structure, leading to greater variations in average rents. These variations could be due in part to condo owners that are willing and able to offer substantial discounts on their units in years where demand is weaker in lieu of keeping the unit vacant longer. Condo investors are generally smaller investors and need 100% occupancy to ensure positive cash flow, while purpose-built landlords generally are bigger landlords and can afford to keep some units vacant. 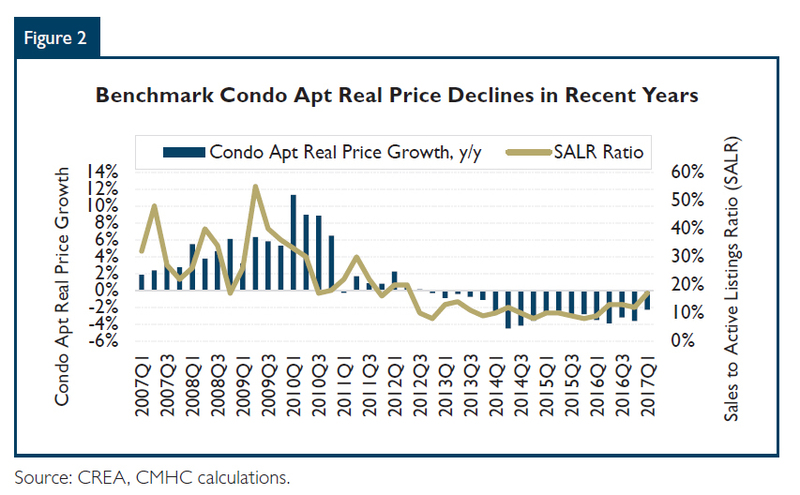 Consequently, the correlations between changes in average condominium and purpose-built rents are not very strong, and generally not significant. We therefore use median rents which are less volatile over time. 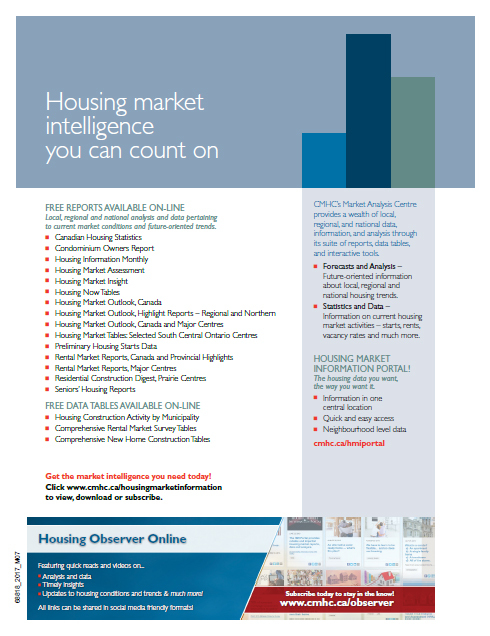 CMHC HELPS CANADIANS MEET THEIR HOUSING NEEDS. Canada Mortgage and Housing Corporation (CMHC) has been helping Canadians meet their housing needs for more than 70 years. As Canada’s authority on housing, we contribute to the stability of the housing market and financial system, provide support for Canadians in housing need, and offer unbiased housing research and advice to Canadian governments, consumers and the housing industry. Prudent risk management, strong corporate governance and transparency are cornerstones of our operations. For more information, visit our website at www.cmhc.ca or follow us on Twitter, LinkedIn, Facebook and YouTube. You can also reach us by phone at 1-800-668-2642 or by fax at 1-800-245-9274. Outside Canada call 613-748-2003 or fax to 613-748-2016. Canada Mortgage and Housing Corporation supports the Government of Canada policy on access to information for people with disabilities. If you wish to obtain this publication in alternative formats, call 1-800-668-2642. To subscribe to printed editions of MAC publications, call 1-800-668-2642. ©2017 Canada Mortgage and Housing Corporation. All rights reserved. CMHC grants reasonable rights of use of this publication’s content solely for personal, corporate or public policy research, and educational purposes. This permission consists of the right to use the content for general reference purposes in written analyses and in the reporting of results, conclusions, and forecasts including the citation of limited amounts of supporting data extracted from this publication. Reasonable and limited rights of use are also permitted in commercial publications subject to the above criteria, and CMHC’s right to request that such use be discontinued for any reason. Source: CMHC (or “Adapted from CMHC,” if appropriate), name of product, year and date of publication issue. Other than as outlined above, the content of the publication cannot be reproduced or transmitted to any person or, if acquired by an organization, to users outside the organization. Placing the publication, in whole or part, on a website accessible to the public or on any website accessible to persons not directly employed by the organization is not permitted. To use the content of any CMHC Market Analysis publication for any purpose other than the general reference purposes set out above or to request permission to reproduce large portions of, or entire CMHC Market Analysis publications, please complete the CMHC Copyright request form and email it to CMHC’s Canadian Housing Information Centre at chic@cmhc.ca. For permission, please provide CHIC with the following information: Publication’s name, year and date of issue. Without limiting the generality of the foregoing, no portion of the content may be translated from English or French into any other language without the prior written permission of Canada Mortgage and Housing Corporation. The information, analyses and opinions contained in this publication are based on various sources believed to be reliable, but their accuracy cannot be guaranteed. The information, analyses and opinions shall not be taken as representations for which Canada Mortgage and Housing Corporation or any of its employees shall incur responsibility.